Nallamuthu Gounder Mahalingam College Founded in 1957, this co-eductational institute in Pollachi offers graduate courses in Arts, Sciences, Commerce, Computer Technology, Computer Application, etc. 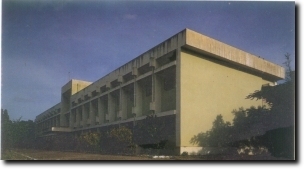 The institution attained autonomous status in 1987. It has a student strength of 1000 and a staff strength of 85. The College hopes to fully utilize the autonomy conferred on it by introducing innovative courses and upgrading the content of the existing courses. The College celebrated its silver jubilee in 1982 and marked the occassion by introducing M.Phil., and Ph.D., programs. Pollachi - 642 001 - India.